I braved the cold for my latest post, sacrificing warmth for the end goal of better photos! Read on to find out how I reached this decision! Although we are in the midst of winter and yes it is cold, the temperature wasn’t as critically low as the previous days to the shoot. Originally we began taking photos with me wearing the jacket, but it wasn’t looking quite right, making me look quite bulky in all the wrong places! I suggested holding the jacket, for that casual look which many go for in street style photos, which in my opinion turned out much better! Fortunately, it didn’t take us long to get the required shots as nearly all of the pedestrians were too busy concerned with their own lives to pay much attention to our photography exploits. It was lucky we managed to get them completed in quick time, minutes after the final click the weather took a turn for the worse and rain began to fall heavily around us! We took quick shelter in some of the nearby designer shops (which can be dangerous to the wallet!). 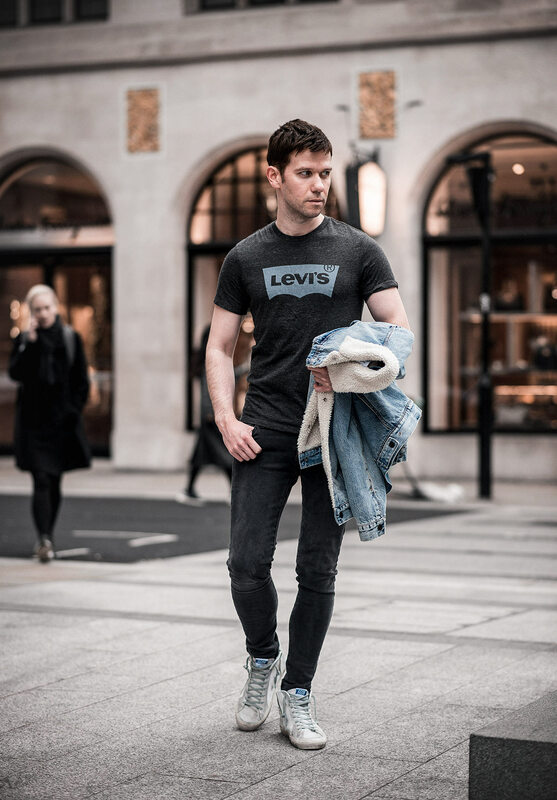 I chose my Levi’s Grey Cord Sherpa Jacket as my outerwear choice because of its warm lining, regular readers may recognise that I featured its tan brother in my earlier Levi’s Sherpa Cord Trucker Jacket Outfit post. I’ve actually owned this version for a few months now, but regrettably an opportunity to wear it never presented itself till now (and again, it is hardly visible, folded and mostly hidden slung under my arm!). My choice of denim was my James Jeans faded black pair, which also doubles up as decent travelling clothing. 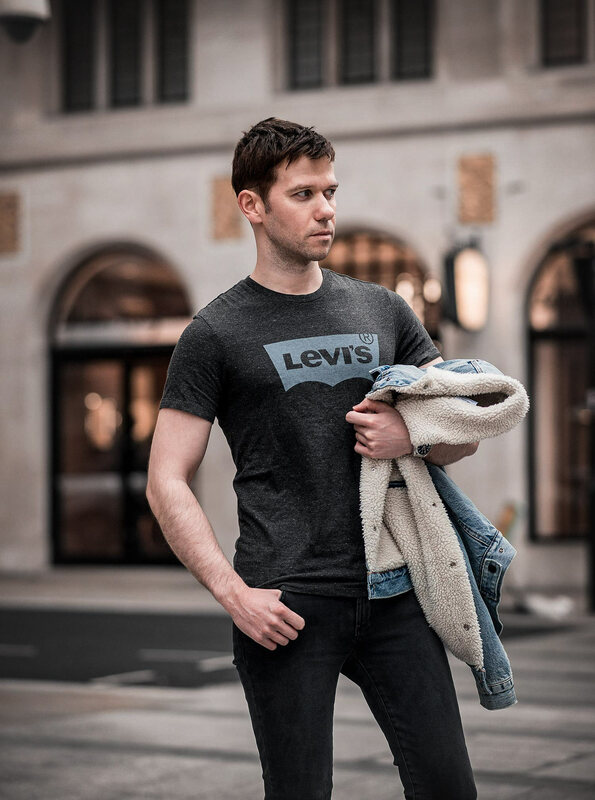 I wore my Levi’s Charcoal T-Shirt with contrasting blue logo printed on the chest (worn in previously in its own Charcoal Grey Levi’s T-Shirt Summer Outfit post). Finally, we have the shoes, which I am very excited about! 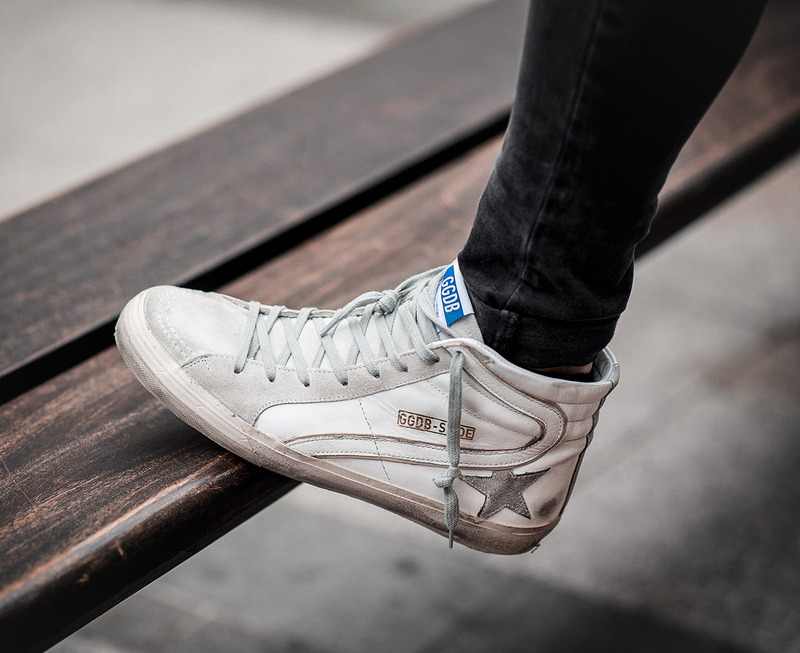 It is one of the first wears of my brand new Golden Goose Slide Hightop Sneakers, I adore them! Keep an eye out for a future blog post review. This selection of photos was taken on the day we were leaving London, following on from my Sik Silk ensemble. 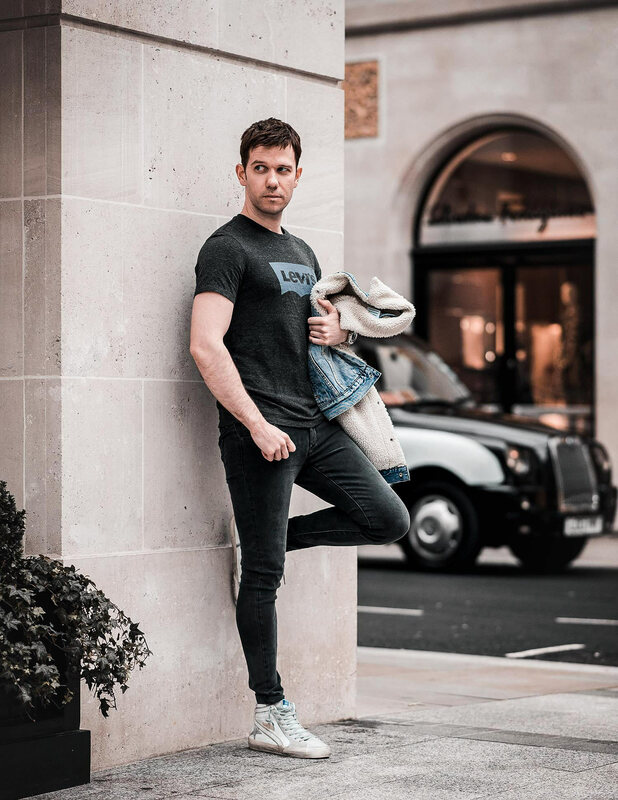 This time, we strayed further afield from Bond Street and instead found an equally lovely background to use for this shoot, which included an ideal bench area for Lorna to use as an impromptu camera tripod! There is something about London which gives the photos that added a touch of class and elegance, paired with a beautiful colour scheme which gels well with my current theme. Whilst taking the photos, we were joined with another couple who agreed with our location as they too started to take photos of themselves (either for a blog or maybe just for some cool holiday snaps!). What do you think of my latest look? Is it something you would wear during the winter? Please tell me in the comments section of my men’s fashion blog.